Q. How are veterans counted? Veterans are men and women who have served (even for a short time), but are not currently serving, on active duty in the U.S. Army, Navy, Air Force, Marine Corps, or the Coast Guard, or who served in the U.S. Merchant Marine during World War II. People who served in the National Guard or Reserves are classified as veterans only if they were ever called or ordered to active duty, not counting the 4-6 months for initial training or yearly summer camps. Q. Why does the number of Veterans in the Service Era indicator total more than 100 percent? In the American Community Survey respondents who indicate that they had ever served on active duty in the past or were currently on active duty are asked to indicate the period or periods in which they served. Currently, there are 11 periods of service on the ACS questionnaire. Respondents are instructed to mark a box for each period in which they served, even if just for part of the period. As some veterans served in multiple eras, totals for this data category may exceed 100 percent. Q. What is the Data Reliability estimate, and what does it mean? 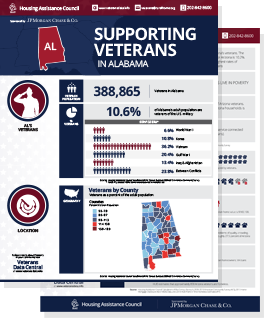 Veterans Data Central presents a reliability index to help users determine the statistical accuracy of data estimates presented from the Census Bureau’s American Community Survey (ACS). The Portal’s reliability index utilizes a coefficient of variation (CV) calculated for each county-level estimate presented from ACS data. Q. Why aren’t there reliability estimates for national or state level data? Reliability estimates in Veterans Data Central are only presented for county level data that derive from American Community Survey (ACS) data. Generally, ACS survey samples are large enough at higher levels of geography (nation and state) that data estimates are largely reliable. Reliability estimates are not presented for metropolitan areas data estimates that derive from the Census Bureau’s Public Use Microdata (PUMS) used in the Economic and Housing categories. Reliability estimates are also not calculated for the 2010 Home Mortgage Disclosure Act (HMDA) data or homelessness data. These data sources do not permit the calculation of a reliability estimate. Q. What is the ‘Mixed Metropolitan-outside Metropolitan’ category? Veterans Data Central uses a unique metropolitan area classification variable that is used in the economic and housing sections of Veterans Data Central. The classification system defines an area as inside or outside of a metropolitan area (2003 OMB) if the PUMA (unique geography used with these particular data used to locate household level information while maintaining individual anonymity) is entirely within that area. Any individual located in a PUMA overlapping inside and outside metropolitan area geographies is classified as ‘Mixed metropolitan-outside Metropolitan’ areas.